In today’s booming Vietnam marketplace, there have been a steadily rising number of international businesses expanding operations to Vietnam. By Vietnamese law, all businesses operating in Vietnam must comply with the Ministry of Finance’s Vietnamese Accounting System, or VAS, which demands a wide array of reports. In order to streamline and reinforce their business capabilities to accommodate sustainable growth or to increase efficiency, most businesses are choosing ERP solutions to create fluency between their various business facets. NaviWorld offers the latest in ERP solution technology and has also enhanced the standard programs to not only meet crucial Vietnamese tax laws but continue to provide the user friendly and efficient functionality of NAV. We also understand that most businesses in Vietnam operate primarily in Vietnamese language and to optimize your business, NaviWorld has tailored Microsoft Dynamics NAV to operate seamlessly in Vietnamese language for your team. Meets all Vietnamese government business reporting and statement requirements including VAT and VAS. Automated government reports that extract your accounting data into an approved template. More in depth accounting that meets VAS, exceeds IAS and improves your accounting and analysis information. One of the main obstacles for businesses operating in Vietnam is creating the necessary financial and VAT authorization statements by the government. We help you automatically produce Balance Sheets, Income Statements and Cash Flow Statements required by the VAS as well as VAT in, VAT out and general VAT statements can be complex and time consuming which reduces errors and makes your people more efficient. In VietNam, the VAS regulations require businesses operating in Vietnam to apply the double-entry book keeping. That means accountants should view their posting in a one-debit-one credit entry. However, the standard NAV is not designed to provide such information. NaviWorld Vietnam’s Corresponding Account functions help you allocate the matching entry into one corresponding entry automatically. Various of reports can subsequently be created detailing your transactions with double-entry accounts information as required by the VAS. NaviWorld customized functionality adds translation of field description on NAV forms and screens in multiple languages. Users can chose to work with NAV in any language available from the translation tables. 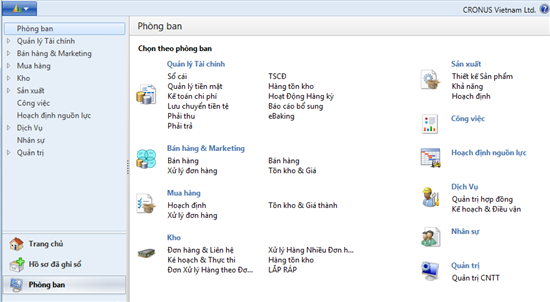 Consequently, the relevant documents can be printed with data captions in selected language, which is useful in cases when Vietnam authorities require business documents to be printed in Vietnamese language. Banking was created because of the demand from various industries that perform many financial transactions and need an efficient solution to manage the relationship between the bank and the accounting department. By automating the frequent bank reconciliation process, this feature saves your business time and resources while identifying problems within seconds to help save money and organize your accounting information. This process only requires someone to upload the bank’s file into the system with a few simple clicks of the mouse.